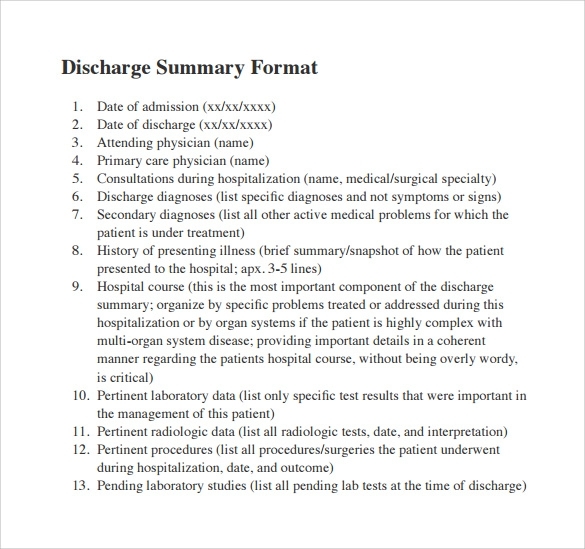 The summary of discharge template consists of different diagnosis process. 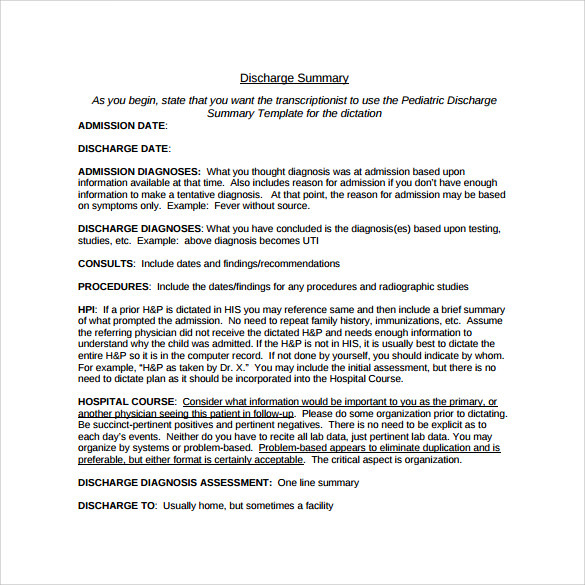 The admitting, secondary and discharge diagnosis. Admitting Diagnosis consist of working diagnosis at the time of admission. The discharge diagnosis should be only diagnosis but any symptom or sign and will not be included on transfer.The secondary diagnosis includes all medical problems. 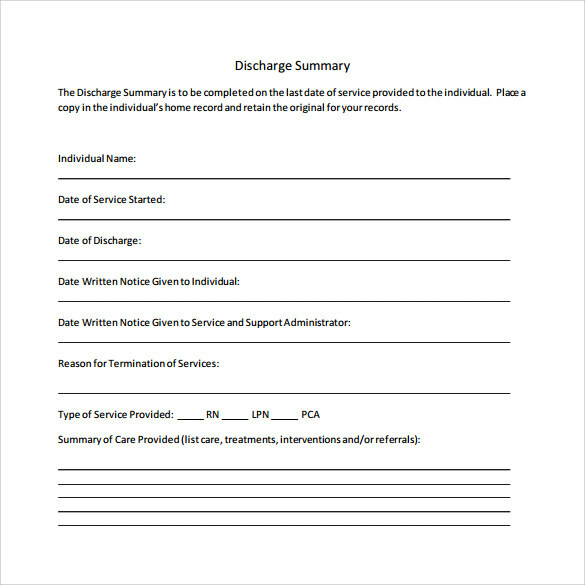 The discharge summary consists of facility, patient name, date of admission & date of discharge. 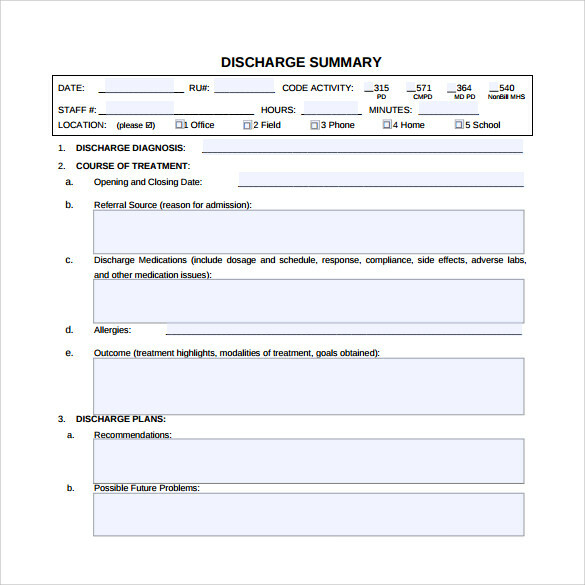 The person needs to fill all the details available in the form including the condition of the patient during discharge. 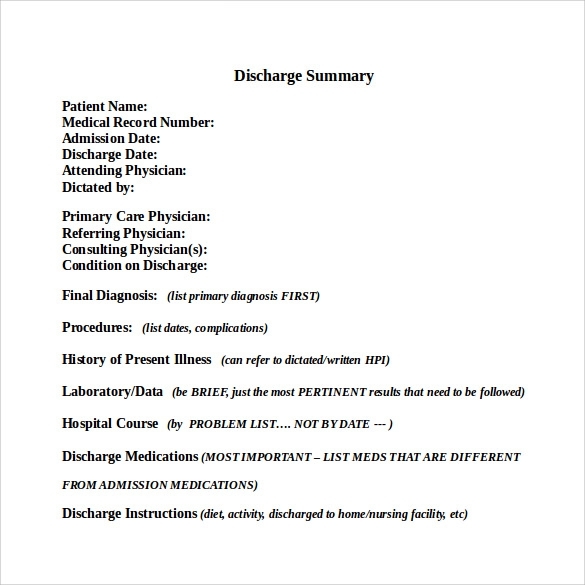 One can check the sample discharge Summary Report Templates available in PDF and word doc file. If you are looking for something that you can download and simply fill in on the computer, then this is perfect. You can fill in the name of the patient, their address, chart number, admission and discharge date, referring physician and more. It also gives information about the diagnosis, tests done and medication given. 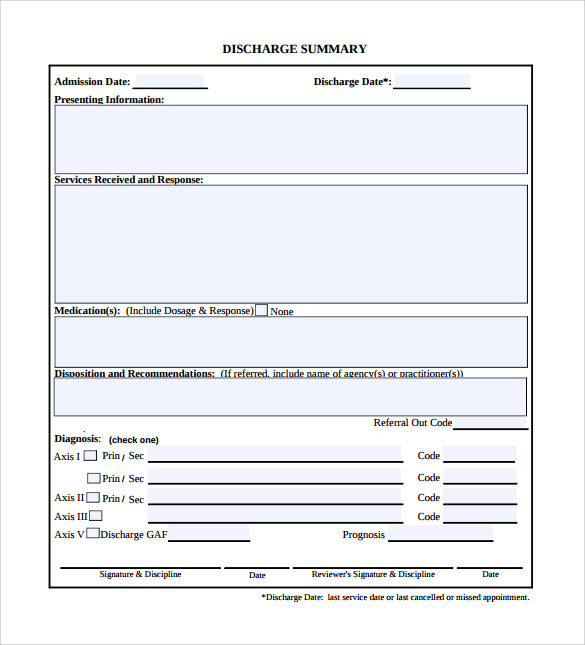 This is another good option that you can fill in with the name of the patient, discharge date, reason for discharge, last contact details and more. It also talks about the condition of the patient when they were discharged and the medications and tests that were given as well as any referral details that were given to the patient for further treatment. This is simple and you can update the date that the patient was admitted, when they were discharged, the name of the attending doctor and more. It also has information about the symptoms, tests that were done, procedures and much more. This is a simple template that you can fill by hand or on the computer. It has information about when the patient was admitted, discharged, information that was given, services that were rendered, medication and recommendations. It also has the detailed diagnosis as well for later use. There are many reasons that you should use one of these templates, such as the fact that it keeps all of the details in one location. Also, it helps the patient and their doctor to know what the diagnosis was and the treatment and medication that was had been undertaken. It also keeps all of the information in location, which means that the prescription and the details are there, which makes it easier for the information to be shared.You can also see Meeting Summary Templates. 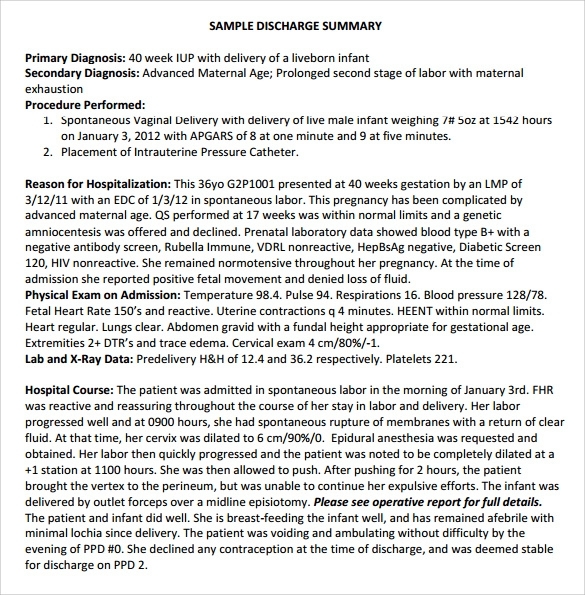 When To Use A Sample Discharge Summary Template? 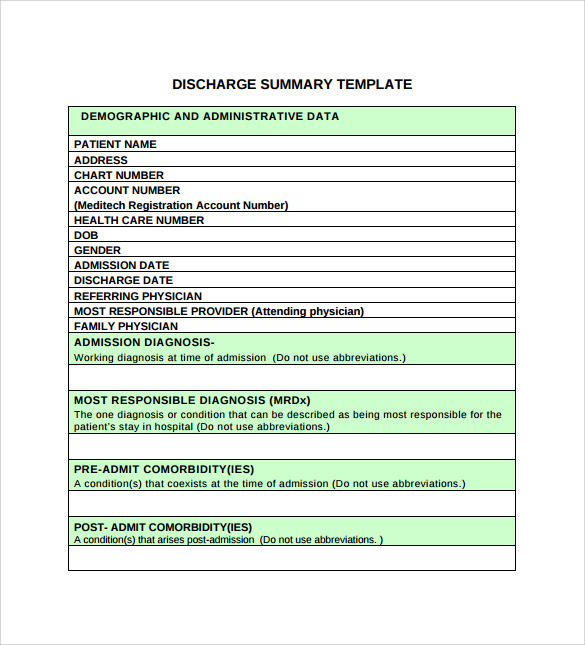 These templates are often used when a doctor is discharging one of their patients and it is where they list information about the diagnosis and further treatment. After the patient has been discharged, then you can give them some tips about how to go about life after they get out of the hospital, including any dietary changes or medication. It also gives information about the diagnosis to let the patient understand and their regular doctor to know what treatment was done. 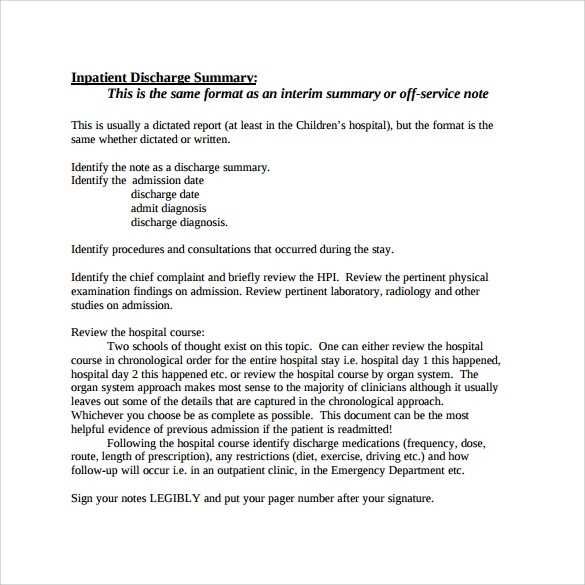 How to Create a Sample Discharge Summary Template? These templates are easy to create and you can find one that you can download and print off. You can also create your own using a Word document, but if you don’t have the time, then simply download the document. You can change it up with the required information, including the name of the hospital, doctors name, phone number and much more. These are easy to create and simple to edit when required. 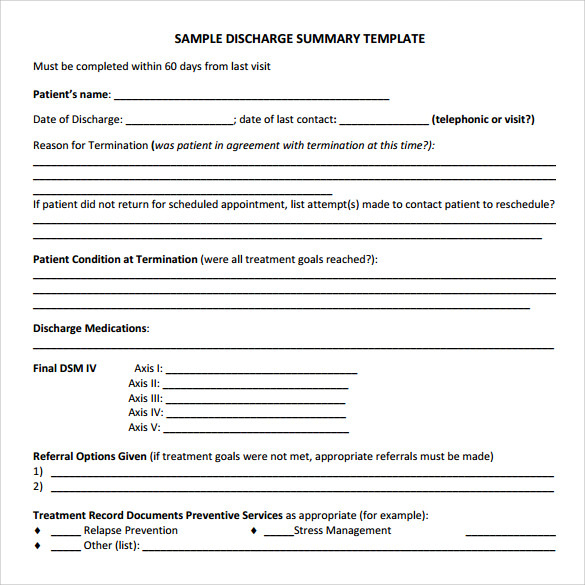 These templates are often used by a doctor when they are discharging a patient from their care, especially in hospitals. It will talk about the treatment that was given and any advice or medication that needs to be followed after the discharge from the hospital. You can also see Case Summary Templates.